Dovecotes were constructed of timber, stone or brick and were of various shapes, round, square, hexagonal or octagonal. Thousands were built from the middle ages onwards, and many survive today. As they provided what was regarded as a luxurious food they became status symbols and so were often sited in a prominent position near the entrance driveway of large houses. Few, however, were built after the late 18th century as they became unfashionable with pigeons being regarded as vermin damaging profitable corn crops. The interior of the dovecote was provided with nesting boxes in the upper part , from which young birds could easily be collected when expelled by their parents. It was long believed that dovecotes provided pigeon meat for the table in winter but recent research has suggested that this view is incorrect. In fact tender young birds (squabs) were taken as a delicacy mainly in the breeding seasons of spring and late summer. They would often be roasted on a spit or baked. Older birds are tough and needed prolonged stewing before use in pigeon pie a dish mainly eaten by servants. 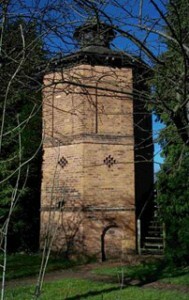 The Moseley dovecote was built in the 18th century probably at a similar time to the icehouse, but the precise date is not known. It was constructed of red brick of three storeys and is octagonal in shape. It had, by 1840, been adapted for general farm use and its ground floor had been converted to two pig sties, and the upper parts became storage rooms. The whole complex of South Lodge buildings was scheduled for demolition in 1933, but public petitions for the dovecote were successful, and this building, with a part of the adjoining “cow-house”, were spared. Plans for restoration of the building were in hand in 1939, but work was suspended on the outbreak of war, and it was not until the 1980s that, with the help of the Manpower Services Commission, it was possible to complete the work.The Dovecote has been placed in the care of the Moseley Society, whose members volunteer to supervise opening to the public.